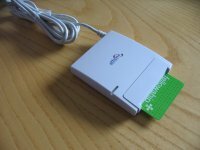 First you need an OpenPGP compatible smart card which can, for example, be obtained by becoming a fellow of the Free Software Foundation Europe. 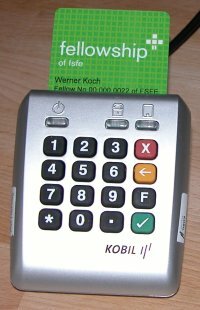 Card readers (NOT those used for flash memory cards) can be obtained from computer stores (e.g. https://www.floss-shop.de/en/security-privacy/). Please note that the USB device class for USB readers is 11 (or 0x0B in hex). This is a small USB reader (CCID; 65*45*8mm) supported by GnuPG directly as well as by pcsclite. This very device is actually the first reader supported by GnuPG and the reason for the internal CCID driver as no CCID driver was available at that time. This is a USB (CCID)/serial reader with a numerical keypad and three extra buttons. The pinpad may be used to securely enter the PIN without using the attached computer (since GnuPG 2.0.1). Only USB has been tested. This reader comes in two types: serial and USB. Both readers are very similar and of the same size (65*45*8mm). As far as we know these readers are no longer manufactured have been replaced by the SCR335 from SCM Microsystems. This USB card reader supports CCID and PC/SC. The older Omnikey Cardman 2020 is no longer produced. The newer reader has not been tested, but Omnikey says that the two readers are compatible. This serial card reader supports PC/SC. The older Omnikey Cardman 2010 (photo) is out of production. The serial version of this reader has not yet been tested. This USB card reader is supported by PC/SC as well as by GnuPG's internal driver. 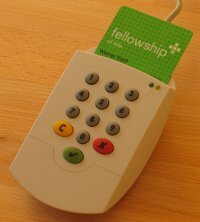 This is actual a dual reader with a second device to access RFID tokens; this is supported by the forthcoming librfid.. This is an USB keyboard with integrated CCID card reader. It is supported by PC/SC as well as be GnuPG's internal driver. The mueric keyblock may be used to securely enter the PIN without using the attached computer (since GnuPG 2.0.3). 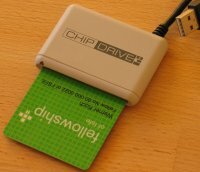 This USB card reader is supported by PC/SC as well as by GnuPG's internal driver. The pinpad may be used to securely enter the PIN without using the attached computer (since GnuPG 2.0.1). This is a CardBus (PCMICA) reader to be used with Laptops. The SVN version of GnuPG supports this reader trough its internal driver. There is no free PC/SC support. A recent Linux version (2.6.15.3) is required. Very handy and useful devices so you can expect any problems to be solved fast. This is a compact reader with USB or serial interface. It works fine with PC/SC (pcscd, libasedrive-usb or libasedrive-serial Debian packages). This is a CCID reader for ID-000 sized cards. It works fine with GnuPG's internal driver and should also work with PC/SC. If you want to cut a full sized card down to ID-000 format, take care to remove all burr and round the edges a bit. This is in particular important so that you are able to remove the card using the tiny blue lever.